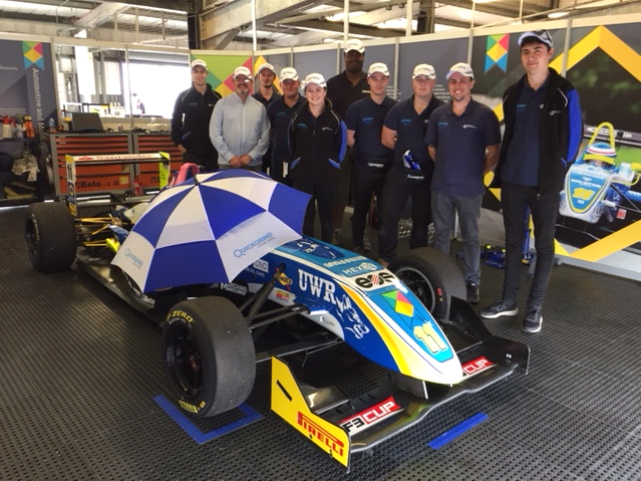 Since March 2018, Quickgrind has been a sponsor of the University of Wolverhampton Racing Team (UWR) as part of our ongoing commitment to work with academia to provide relevant industrial expertise and training to the next generation of engineers. In a very short period of time, Quickgrind has formed a strong relationship with UWR with almost weekly communication between our cutting tool experts and the engineering staff and students working at the university racing team. Forming a close working relationship with the race team, it is safe to say that we have formed a winning formula. As part of the sponsorship agreement Quickgrind receives invites to UWR events and races organised throughout the year. In return Quickgrind are supplying a vending machine and tooling solutions that are soon to be installed at UWR’s state of the art machining facility. The Quickgrind cutting tool specialist are also providing full technical support, software support and training days. We are currently negotiating the opportunity for joint Open Days and other events at the Engineering campus. To date, Quickgrind has attended the 2018 F3 car unveiling in April and also the Morgan race team opening event in early June. Most recently Quickgrind attended Round 3 of the F3 Cup Series held at Silverstone on 23rd – 24th June, and what a weekend it was. Mike Stobart and Graeme Hogg were invited to attend Round 3 of the F3 National Cup series held at Silverstone. From the minute the Quickgrind team arrived on Saturday morning, we were made to feel welcome and part of the team. UWR’s Development Manager and main sponsorship co-ordinator, Mr Terry Gibson met us at the entrance with a hearty good morning. We went straight to the pits to meet the team that included all the students working on the F3 Team, the UWR technicians and driver Shane Kelly. The reception from the team was somewhat humbling and we felt like part of the whole set up as soon as we entered the UWR pits. The UWR team is extremely hospitable and professional and it was evident that they fully value our expertise, input and contribution as a team sponsor. The car finished second fastest in morning practice and walking around the pits at one of the world’s most famous race circuits is something we’ll never forget. You really do have to be in the pits to fully absorb the atmosphere when the engines are being fired up all around you. Being in this environment, you genuinely get an appreciation for all the hard work. The student dedication, commitment and enthusiasm is truly infectious. From a Quickgrind perspective, it fills us with great pride to be involved with such a professional outfit and when you see the hard work of the students, it re-affirms our commitment to educating and working with the next generation of engineers. There were several different classes of race on the Saturday calendar, the F3 Cup being the cream of the pick. It’s fascinating to watch so many different cars racing, from VW Beatles to full blown works BMW and Porsche. It also highlights that there is so much more to motorsport racing than just F1. Saturday was more relaxed than the race day on Sunday and Mike and Graeme were allowed to stand on the pit wall and watch proceedings unfold. The afternoon timed session saw the UWR car finish second fastest again, giving the car second place on the grid. When the race finally came round, the anticipation of a podium finish was a very real prospect. The race itself was pretty much as the grid positions went. Shane Kelly finished second. Another couple of laps would have seen him take first place as he was catching the leader with every second, and was right up his exhaust over the finish line. Sunday was the full-on corporate day and the sponsors were invited to the Brooklands Stand to watch the racing unfold. The icing on the cake was the balcony view of the circuit and its location right above the holding lane. The Quickgrind corporate goodies that we handed out to the UWR team were put to good use. 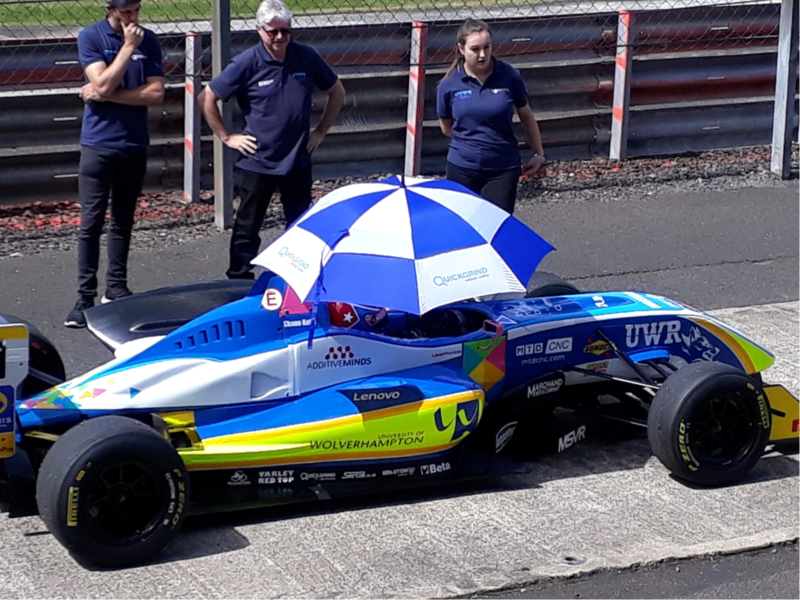 The Quickgrind umbrella was given excellent exposure, shading the driver from the searing sun as they awaited the start of race two. It was a superb sight to see from the Brooklands stand, and another proud moment to work for Quickgrind. Thanks to Kate, the UWR team leader, an inspirational moment with the addition of the umbrella. Race two on Sunday was an equally thrilling event, the lap times were up again with the weather conditions helping the grip. The UWR car finished third in race two keeping UWR in second place overall in the championship. Being sponsors of a team that has a genuine chance of winning the championship just added to the enthusiasm and excitement on the day. It’s hard to take in that this high powered race car with state of the art technology is actually fully maintained by University students. Each student has a specific task and adhered to their rolls with complete dedication and enthusiasm. These engineers of the future were a joy to watch as each of them busied around the car when it was in the pits. After every practice session and race, when the car entered the pits, they went about their duties with Swiss timepiece precision. At Quickgrind, we are all proud to be part of the UWR journey. Our name is prominently displayed on the car in three different locations. This is no Mickey Mouse team just making up the numbers, UWR have a seriously genuine chance of winning the 2018 F3 Cup Series. There are more races to come and other staff at Quickgrind will take the opportunity to soak up the infectious atmosphere of high-octane car racing. Watching the driver on the podium and knowing your company has played a part in getting him there is a proud feeling. Roll on Oulton Park, there’s more podiums to come – demonstrating that Quickgrind and UWR are definitely a winning formula.